Now, letâ€™s get a few more details about the two so we are better able to understand their different properties in baking and cooking. What you will see more often used in gluten free recipes is potato starch. 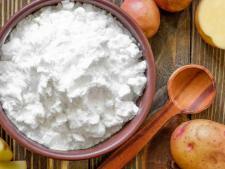 Potato starch is a very fine white powder starch, similar in texture to cornstarch. If youâ€™re not very careful when working with and measuring potato starch, you can create quite a cloud in the kitchen! BUT, if you use potato starch as a thickener for a liquid (like gravy or a sauce), hereâ€™s a very useful tip: Unlike cornstarch, a liquid thickened with potato starch should never be boiled. The potato starch loses its ability to thicken once boiled.